I love food. I love to make it and I love to eat it (but mostly make it). Every Friday I intend to post a new recipe for you to try. I won't post it unless I have tried to make it because I want to know it is delicious. It is a tad made up so I will guarantee you, you will make changes. I didn't branch off of a recipe so bear with me. There will be a lot of "pinches of this" and "touches of that". 1 lb of ground beef (or turkey) browned and drained. 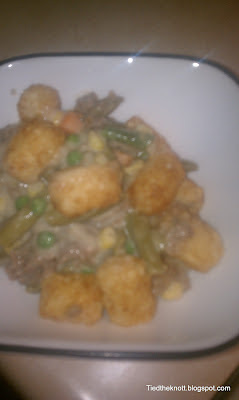 Mix the beef, milk, soup, and veggies together. 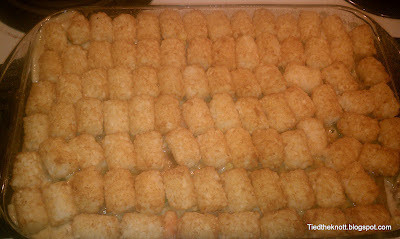 Add in a couple of frozen tater tots so you have potatoes in the mixture and pour into an un-greased 9x13. Top with rows of tots, sprinkle with season all or whatever spices you like, and stick in the oven for 1.5 hours or until the mixture is heated all the way through and the tots on top are golden. Plenty for leftovers since it was just the two of us. Terrible phone picture (pre-camera) but HOOOOOOLY delicious. Don't forget to link up for Food Friday!